Where we stayed, did, ate, and how to make the most out of travelling as a family! Kids are SO fun to experience the world with! We used to travel before kids and that's incredible in its own way and now to experience it with and through their eyes is just as fun and rewarding. I am a big believer you don't need to do elaborate trips to appreciate the world. Sometimes world travels just means exploring a new corner of your current world. Growing up, in a family of 7, my dad had a goal to take us on one trip a year, and that usually meant us piling in our 12 passenger van and road tripping and camping along the way. Those were the best memories of my life and instilled the love for travel, people, and adventure in me. When I became a teenager I found ways to travel internationally and that opened my eyes and heart to a whole new level. It changed me, and I am forever grateful for those experiences and that is what fuels the desire to make that happen for our own kids. On the flip side, when our children are eating well and are on a good schedule they are up for adventure and no one has to experience melt downs. The easiest way we have found to have kids that are epic travel companions is eliminate or limit sugary, processed foods. If your children are used to these types of food perhaps do a bit of a reboot or a preview of meals that you might be having on your travels before you travel. This will get them into the swing of things which will keep them smiling, skating, surfing, running, hiking, swimming or wherever your journey takes you all day long! Before we travel, we talk with the kids, we get them pumped, let them know what we will be doing, try to get them in the adventurous spirit to try new things, new foods, pull out the map, google or get books on the places and remind them that we are going into another peoples culture so to be respectful and remind them that this is another way of lifeand they are getting the chance to learn and experience it! To keep them keen it really does comes to letting them know whats up, consistent fueling and staying well rested. We always use a good pro-biotic, and stalk up on whole food at the nearest market. This summer we learned that Europeans don't really seem to sleep in the summer! haha. So we had really late nights with our kids yet they were fine and none of us got sick the entire trip. I can only credit this to healthy whole foods and letting them sleep in on those late nights. And keep in mind our kids do indulge in treats but its never on an empty stomach and a wholesome breakfast(no donuts, sugar juice, sugary cereal) is a must in our family. We lived in France for a year while Shem was attending school so going back was bit of a homecoming for us. Ira was born in France and Tama went to an all French School. It was the first time that we had lived away from any family. France is so special to us in so many different ways and on so many different levels. Biarritz feels like Hawaii met France and the two made a cute little Hapa town baby. It is so rich with culture and tradition and has that feeling that you want when you come to France. With a castle that meets the water, a cathedral that over looks the city, cafes lining the streets and a traditional french market that has all the local favorites from the region. At the same time it has this super cool and cute surf culture that is sooo fun! 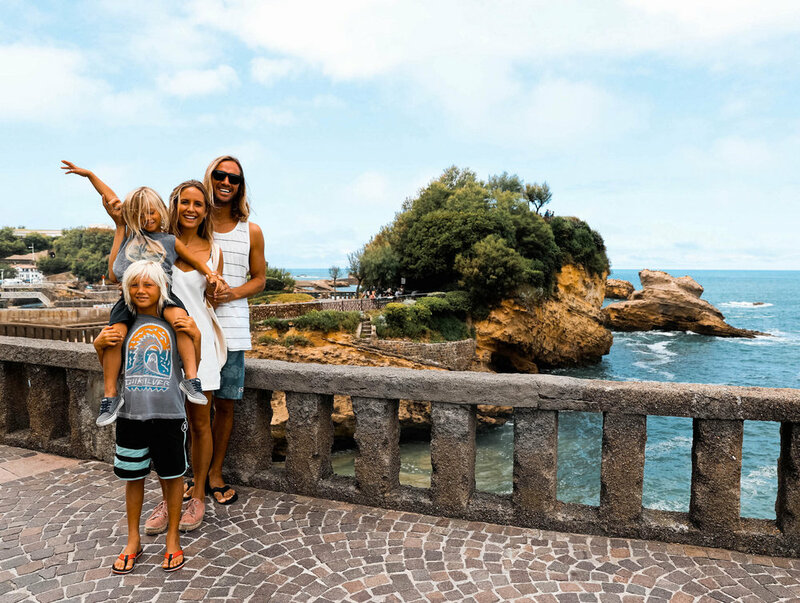 With surf that is good for anyone that is learning, from the keiki to the experienced surfer Biarritz really has something for everyone. There are great little shops and restaurants at every tight and tiny turn, I feel like we could have spent a month here and still leave wanting more. This entire coast all the way into Spain is so acessable and makes for great day trips. The Basque Country is truly unique. We have stayed in Biarritz a few times in the past and we stayed really close to the ocean but we wanted to be more central this time. We found an awesome Airbnb ran by a nice man named Phil. Their place is incredible and has 3 rooms that can sleep up to 10 people along with private parking which is huge because parking can be crazy if you don't have a private garage. It is centrally located and a block away from the Market. During the summer the market is open from 6 am - 2 pm everyday. 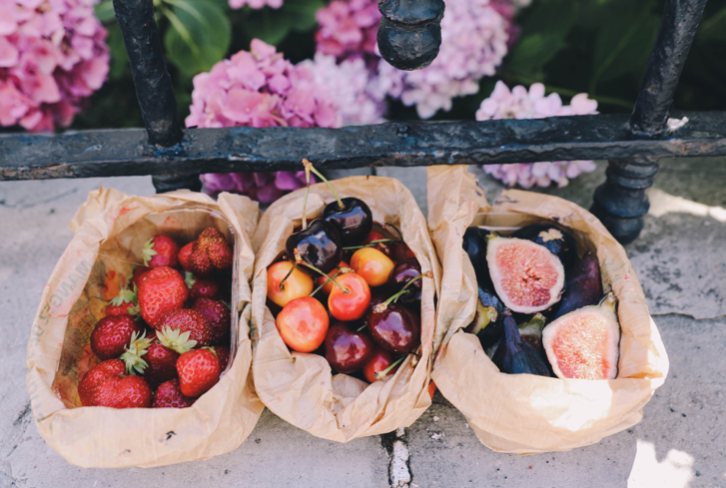 One of our favorite things to do was go with the kids and pick out fresh fruit and a baguette for the day. My absolute favorite was the figs, oh the figs if I could only go back for those insanely fresh, sweet and juicy figs! I would go every morning before the kids woke up and pick up a bag for myself :) I looooove figs and fresh figs this good cannot be found in Hawaii. Tama loves cherries and I think he pounded a kilo of cherries on the daily haha. Skateboards, Skate Parks & Skating France! We took the boards just about every where we went because we know that as long as the kids have their boards they will have fun whether we are walking around, or waiting for a table at a restaurant. Alot of kids use scooters for this very purpose! One of the beauties of France is that there is a skate park in just about every town. Our kids love to skate and skate boards make for the city walks to be much easier and go by much quicker for the kieki. The first park we went to was Labenne which is about 30-40 min. North of Biarritz. We found this park when Shem and I stayed in the small town of Labenne 6 years ago. It’s a relatively small park with a decent bowl that is good for intermediate to advanced skaters. There is also a small ramp for younger kids off to the side where Ira played most of the time. One of the coolest features was a pump track that even Ira could do on his knees. We spent an entire afternoon here because the boys loved it so much! This park is much larger and has a really good variety for the kids. There is a large bowl that is for advanced skaters but has a gradual lead in that Ira and Tama both had so much fun on. There is a small pyramid in the middle of the park that was perfect for the boys and a half bowl at the entrance of park where Tama spent most his time. In Biarritz we rented all of our wetsuits and boards, even a boogie board from BTZ Proshop. They even had a little wet suit for Ira. Great place to rent gear and the owner and his staff are just the coolest people and quite cheap to rent! Click here for link to map of the shop. Zarautz is about an hour drive and we decided to go there as we started out for a hike in the morning then it started to rain. So we asked the kids “You want to hike or surf” in synchronization as if they were anticipating the question they both said surf. Zarautz is a great little town with a nice stretch of beach. Its is all sand bottom so on the low tide and probably high tide too you can walk out for a couple 100 meters and the water stays about knee to waist deep. We rented cool little boards perfect for the kids and just messing around from Moor Surf Esola Zarautz. The ocean was still a bit churned up and it was mostly wind swell so we stayed just on the inside of where the wave were breaking and the kids could take the white wash all the way to the dry sand. Both Ira and Tama had so much fun just in the white wash, as if they were missing the ocean after being in Canada for only two week prior to coming Europe! Grand Plage is a great little beach but can get really crowded both on the sand and in the water. If the tide and swell is right squeezing in an early morning session here you can get uncrowded fun waves. We all had a lot of fun here as there are few peaks to choose from. We surfed the middle peak in right out in front of the Casino and it’s left and right that is for the most part soft and sloppy good for both intermediate and experienced surfers. The wave can get kind of slow so its good to have a chunky board that can float and cruise through the soft sections. If you like to short board its also fun as the waves works closer to shore and becomes a little more punchy. We spent the day here cruising on the beach and taking turns surfing with the kids and playing in the shore break. There are great little cafes overlooking the beach a few yards away where you can grab a quick salad or snack and you can watch your stuff from the patio while you eat. The surf schools don’t typically have classes in the early morning so if you surf then early morning or evening sessions might work best if the swell and tide are good. If you're learning this is a great spot to do so with a lot of different school to choose from just out in front of hotel (click here). For the most part this wave is really soft and great with a fun board or long board. On the right tide and enough swell it can have a good push to short board but a bigger board will suit the wave better. This spot is great for kids. The far inside Ira caught the little waves with Shem along the small sand bars that reformed from the whitewash on the inside. Tama and I paddled out to the outside and caught nice long soft waves all the way to the inside! Edibles - where to eat! This is where we lived while Shem was going to school and where Ira was born. This was the first place we lived where we didn’t any type of family less than a mile away. We loved living here so much so coming back we were uncertain how it was going to be. Although our stay in Bordeaux was less than 48 hours the city is so amazing we were able to see so many good friends and do so much! This is where Tama learned how to skate while living in France. It was so cool to see him back at this little park and now skating with Ira! The park is serrated in to three different areas, vert ramps and bowls, concrete street style, and a kids park. Because there are so many different elements to the park its easy for any age and any skill level to enjoy. It is also located right alongside the Garonne river so its a great place for the kids to burn energy as there is a really nice bike and walking path with several little playgrounds all along the way. We were invited here by a few friends and had never been here before. The night we went University of Bordeaux had their final exams that same day so the placed was slammed with college students as there is a restaurant and live music several times a week there. Our kids seemed to like the atmosphere because they had no problem getting right in the mix. There are two parts to the skate park, the outdoor pool/bowl and the indoor park. The kids started off in the pool even though it was lined with people on the edges using the ledge as a place to sit haha. This was surprising to us because Tama is relativity quite shy. It was fun to see him get out of his comfort zone. After about an hour or so our friend introduced us to a friend of his who opened up the indoor skate park because he just wanted to stoke the boys out on all the ramps. The indoor park is huge and the boys were in dreamland because they had the this massive park with every ramp possible all to themselves. We skated until midnight that night. It was one of their best memories! They also serve food here but the night we went the restaurant was closed and they were serving a limited menu with mostly sandwich type foods with drinks. It would definitely be a place we would return to for the kids and to check out the food options. What makes Bordeaux so beautiful is that it is set just along the Garonne river and surrounded by beautiful country side. The second day we were in Bordeaux it was our friends birthday. They invited us along for cable wake boarding at Ski Nautique. Ira doubled with me and went on the knee board which he was so proud of himself for doing. Tama and Shem wake boarded which was an amazing experience for Tama because it was his first time trying it. It took him about 6 times to be able to get up and stay up and then it took him another 3 times to make the turns. Activities like this are so fun because they are new and exciting for the kids and helps them push their abilities. He was so cute when we finally succeeded and probably could have stayed until it got dark! This was a great discovery because the city can get really hot in the summer and the closes beach is about 45 min away. Having a place like Ski Nautique so close and accessible to the city it is easy to go there for a couple hours during the day and not take up too much time. We didn’t eat out at all while here because we ate with friends most of our meals, so I will tell you the one place that we did grab a quick breakfast before we left. This is right on the corner of Place Gabetta and Palais de Galien so it was super close and convenient for where we were staying (2 min walk). We stopped in for a quick take out bite and they had an amazing peach and raspberry crumble that was gluten free and vegan! They make everything fresh and this literally tasted like it just came out of the oven. It was hot and most with the crust being nice and crispy! It seriously tasted like it was made in my moms kitchen. Definitely recommend it! This market is really amazing but only open Sunday mornings. It is set up right along side the Garonne River. When we lived in Bordeaux we would walk to the market mid morning or towards lunch with Tama and the skate boards and would just wander through the market and grab little things to eat or a lunch and spend the morning by the river eating and at the skate park! Gosh it brought back such good memories to walk down there with our little fam bam and appreciate it just as much now as we did back then. This market is open daily and on the other side of the city close to the train station. While leaving in Bordeaux I would run here grab some fresh produce or vegan samosas that were sooooo good! This is a great place to shop for local produce and specialties from the region. There are a lot of different vendors and they all sell a really good variety! Anyway! Hope this helps for the people asking! France has a million food options and things to do from natural adventures to museums etc. As much as I love Biarrtiz, Hossegor is where we would stay next time as its a little more chill! Next wetook a train to Switzerland next which we will write about soon! Ahh man, I can't wait to share. Aloha!